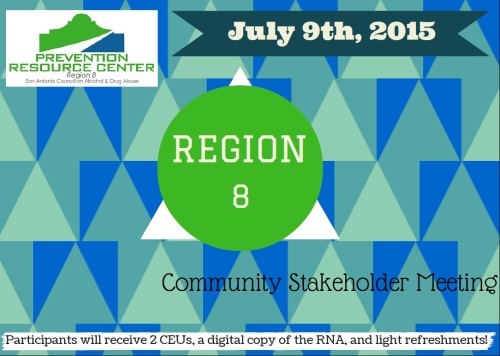 The Prevention Resource Center invites the Region 8 community to join us as we share the highlights and findings of the 2015 PRC Regional Needs Assessment (RNA). Participants will see what the data says about the Region 8 community as it pertains to substance abuse and learn how to use the RNA as a tool to guide prevention strategies. The Region 8 Community consist of the following Counties: Atascosa, Bandera, Bexar, Calhoun Comal, DeWitt, Dimmit, Edwards, Frio, Gillespie, Goliad, Gonzales, Guadalupe, Jackson, Karnes, Kendall, Kerr, Kinney, La Salle, Lavaca, Maverick, Medina, Real, Uvalde, Val Verde, Victoria, Wilson, Zavala. RSVP to Attend: Call (210) 225-4741 or email Gyna Juarez at gjuarez@sacada.org. Participants who stay for the full duration of the of the Community Stakeholder Meeting will receive 2 CEUs. Participants will receive a digital copy of the RNA at the conclusion of meeting. Light refreshment will be served, seating is limited and RSVPs are strongly encouraged!